The Supported Employment Services at Impact Behavioral Health assists participants in utilizing the skills and experience they already possess to find employment that places them on the path towards their future career goals. Our programs utilize Individual Placement & Support (IPS) model, an evidence-based practice of supported employment developed at Dartmouth College. The IPS model not only incorporates employment into the recovery model but treats work as an essential. IPS has been studied with multiple populations and has shown overwhelming evidence of success. Work is an important part of recovery. Studies have found that employment is an important part of health; however, the type of employment matters. IPS models look for competitive employment, not employment that is specific for people with serious mental illness. The work is in the community and has a wide array of positive impacts. Job Development, . . . The Employment Services Staff at Impact Behavioral Health prides itself on developing strong relationships with local employers. These employer relationships yield optimal job matches through detailed knowledge of each employment opportunity and position our staff to provide optimal follow along supports post-employment. Career Exploration, . . .
Impact’s Employment Services are focused on making job matches that are a good fit for our participants. Utilizing a vocational assessment tool, we discuss participants’ skills and experience, learn about his or her personal interests, and inquire about his or her employment aspirations. Using this information, employment staff will aid program participants in identifying career avenues that will lead to long-term success. Benefits Planning, . . . The most common barrier identified by individuals considering the IPS Program is the fear that they will lose the benefits which they depend on, such as SSI, SSDI, and Medicaid, if they become employed. All IPS participants are provided with expert benefits counseling from a State-funded agency. The counseling staff will develop an individualized benefits plan tailored to each participant’s specific situation and employment goals. Assistance with Resumes and Cover Letters, . . . Through thoughtful and responsive technical assistance, Impact’s employment staff helps to develop quality job-seeking tools which target the types of employment our participants want. Interview Preparation, . . . Participants of Employment Services are prepared for the pressure of interviews through one-on-one counseling to improve responses to questions, mock interviews with actual employers to acclimate to the interview environment, and processing of past interviews to identify areas of improvement. 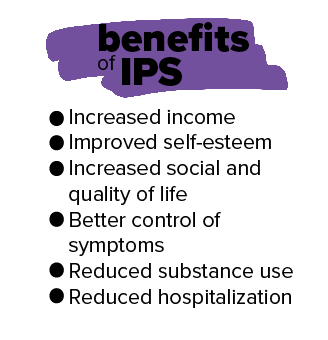 The Private Pay program at Impact Behavioral Health utilizes the key principles of the IPS Supported Employment model to achieve successful employment for individuals utilizing private therapy or who receive no clinical services. Unlike other self-pay employment programs, Impact does not require extensive testing or screening as part of the program. Our goal is to begin designing and implementing an effective job search as quickly as possible. In addition to job search meetings, our expert job developers will work to form relationships with the employers our clients express interest in. Josh was referred to Impact's Employment Services Program in August 2017 hoping to get a job in a retail environment. Josh hadn't worked since 2007 and was eager to start making money in order to be self-sufficient and add structure to his life. Josh went on several interviews but unfortunately was not able to secure a job. Impact's Employment Specialist, Anna met Mike from Play It Again Sports in September 2017 and started developing a working relationship with him. Mike was very interested in working with the Employment program, and brought Josh in to meet with Mike and take tour of the store. Josh was very nervous and shy at first, but was able to speak more confidently with the support of his employment specialist. In January of 2018, Mike said he wanted to hire Josh as customer service associate. Josh started working in January and has been enjoying the job ever since. Josh continues to work on his social skills with customers and develop coping skills with his employment specialist to help with anxiety and depression. Impact's Employment Services Program collaborates with several other agencies to provide their clients with employment services that they would otherwise not have access to.